Take in the spectacular views and experience the transition from salt to fresh water on a Locks Cruise! This narrated cruise provides you with knowledge, fun facts and the chance to become the attraction to those on shore as your vessel raises up or lowers, due to the ever-changing tides of Puget Sound. Between Elliott Bay and Lake Union you’ll be surrounded large fishing vessels, seaplanes, majestic city parks, floating homes and photo ops views of mountains, city skyline and the Space Needle. Full bar and snacks are available for purchase on board. The above listed Boat & Bus Lock Cruise option is a round-trip experience that includes a motor coach transfer - based from Pier 55. A one way Stay & Play option (not listed) is available as well. 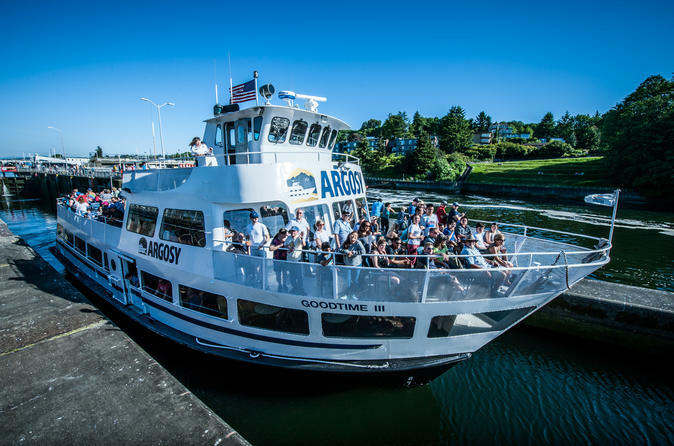 Hop aboard the Locks Cruise and learn all about the complex Locks system that provides a link for boats between the salt water of Puget Sound and the fresh water of the Ship Canal, which connects to Lake Union. Watch as the Locks' water levels are adjusted to allow their safe passage, and spot the fish ladder, built to allow salmon to pass between the fresh water and salt water. You'll be treated with live onboard commentary and views of the stunning Seattle skyline, Lake Union, Puget Sound, the surrounding mountains, Elliot Bay and a parade of sailboats, motorboats, tugboats, barges and yachts passing through the Locks. You'll even cruise past the iconic floating houseboat community that was featured in the movie Sleepless in Seattle, so take advantage of great photo opportunities here!